Breast augmentation doesn’t only add size. It transforms the shape and quality of the female chest. Breast augmentation is an incredibly popular procedure that uses breast implants to enhance the size, shape and proportions of a woman’s breasts. Hundreds of thousands of women undergo breast augmentation, breast enlargement and breast lift procedures every year; it’s the most popular form of plastic surgery in the US. You may seek your perfect pair for many reasons: from adding symmetry to your cups, to restoring shape after weight loss, to increasing volume for a balanced look. Breast enhancement can transform the way you dress and improve your self-confidence. Under Dr. Usha’s experienced hand, it’s the right time to consider your own procedure. Dr. Usha and her professional team are here to guide you through your augmentation from evaluation to post-operative care. No matter your reason is for seeking implant surgery in San Francisco, we’re dedicated to premier care through your enhancement journey. Natural looking breast enhancement with a woman’s touch. Board certified Dr. Usha is the breast implant and female rejuvenation specialist in the Bay Area. If you’ve wanted curvier breasts and a more feminine figure, come learn about breast augmentation with Dr. Usha and her team. Why Dr. Usha for Breast Augmentation? What are some risks of breast augmentation/implants? How soon can I resume regular activity after surgery? What will my postoperative appointment schedule look like? How visible will my incision scars be? How soon can I use scar removal cream and laser treatment after breast augmentation surgery? How painful is the recovery? What is recovery like after surgery? How long will my breast augmentation last? Do breast implants have a warranty? When will I need to replace my implants? Breast Augmentation (augmentation mammaplasty) encoumpasses many specific breast enlargement procedures including not only breast implants and breast lifts, but also many techniques which provide symmetry and other overall aesthetic improvements. You may undergo breast augmentation for variety of personal reasons. Many women want their bodies to be more proportionally balanced. Others wish to improve their aesthetic profiles, add volume to sagging breasts, or address damaged breasts due to trauma or sickness. Your Bay Area breast enhancement journey will begin by scheduling an in-person consultation with Dr. Usha. You will be oriented by our passionate team at our San Francisco breast implant facility. During your session you will be able to ask questions and receive a complete evaluation of your goals. 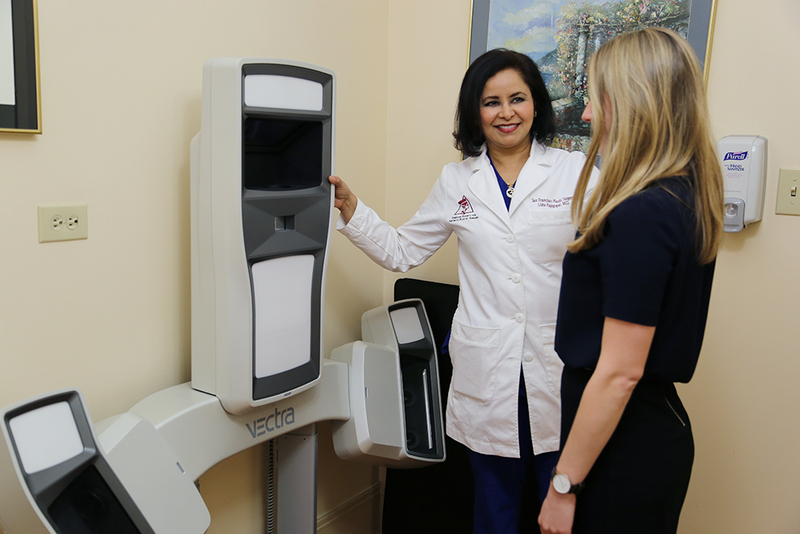 We use the most advanced body simulation technology available at the San Francisco Plastic Surgery and Laser Center: the 3D Vectra XT imaging system. Our Vectra is a cutting-edge body scanner. With the Vectra we can simulate how different implant sizes and shapes could appear on your body, showcasing your breasts before and after implant surgery. This patient is 34 years old with 2 children. She originally had 34B cup size. We inserted Natrelle Inspire 330cc breast implants to give her a full C/small D breast size. Our office used Vectra 3D to simulate how her breast will look after surgery. Considering breast augmentation surgery? Take a glimpse into the future of your body. Proper patient education is one of Dr. Usha’s highest priorities. Dr Usha carefully evaluates each patient’s body and talks with them about the potential risks of breast augmentation as well as the comparative benefits of breast enlargement vs breast lift surgery. To learn more about our personalized evaluation process, contact our office to schedule a consultation with Dr. Usha today. Some of the most frequently asked questions about San Francisco breast augmentation regard the choice of implant. As breast augmentation techniques have evolved over the years, so have the implants doctors use. There are three types of implants: Silicone, Saline and Highly Cohesive Silicone (“Gummy Bear”). There are notable advantages and disadvantages of each implant type. There is no one size fits all. Different bodies require different implants to achieve similar outcomes. Choosing the type for your procedure is a matter you and your plastic surgeon should discuss. SALINE - the classic liquid-filled implant. Uses smaller incisions during placement than silicone. Provides adjustable implant volume during surgery. Easy to notice ruptures or leaks in the implant. Slightly more affordable than other types of implants. Considered safe for women age 18 and older. SILICONE - the softest and most natural feeling implant. Is regarded safe for use in augmentation. Low likelihood of rippling compared to saline implants. Uses a longer incision compared to saline. By far the most commonly chosen implants due to their more “authentic” look and feel. Considered safe for women age 22 and older. GUMMY BEAR - the firmer, more durable new implant. Uses a highly cohesive form of silicone gel. Provides lower instances of rupture, rippling and other effects compared to other implants. They come in two basic shapes: round and teardrop, which maintain their shape well over time. The teardrop shape may produce a very natural looking result. These form-stable implants may be more expensive than traditional silicone. The vast majority of women today choose silicone over saline. After decades of concern over the safety of silicone, it’s been proven that silicone is not harmful to the human body. Those who select saline implants often choose it for the smaller incision sites and lower cost. It’s crucial to be informed by your surgeon about your implant type before surgery. There is no “one size fits all” when it comes to breast implants-- even for the same cup sizes. Dr. Usha uses her vast knowledge of implant types to recommend implant types that are safe, effective and tailored to your body. We offer several San Francisco breast augmentation procedures utilizing the latest techniques. With two decades of experience in breast enhancement, Dr. Usha and her team makes implant surgery straightforward and as minimally invasive as possible. After your evaluation, Dr. Usha will recommend which implant incision sites is right for you. Surgery will take place at our Bay Area breast implant office, located in downtown San Francisco. There are 3 type of incisions for breast implant surgery. The method of inserting your implant will depend on your anatomy and Dr. Usha’s recommendation. The incision can be made either in the crease where the breast meets the chest, around the areola or in the armpit. Every effort will be made to assure that the incision is placed so resulting scars will be as inconspicuous and minimal as possible. Breast augmentation is a surgical procedure. Like most forms of surgery, there is downtime associated with implant surgery. After you leave our office, the operating site will feel tired and sore for a few days. You will be up and about after a day or two of rest. You will be prescribed medication which alleviates some of the pain and discomfort you experience during recovery. There may be scars from the operation depending on how your body heals. Initially your scars will be pink and firm for about six weeks. Your stitches will be removed in a week to ten days, while swelling may take three to five weeks to subside. You should be able to return to work within a week or so. Breast contact is allowed once your breasts are no longer sore, which is five to six weeks after surgery. You have optional care appointments with Dr. Usha during your recovery. Our trained staff will ensure your visits are as comfortable as possible. These appointments are to make sure you’re making smart lifestyle choices on the road to a healthy recovery. The decision to undergo plastic surgery is a long-term commitment. It’s a months-long process to heal and recover. You can have confidence Dr. Usha will be with you each step of the way-- providing expert counsel, a steady hand and over 21 years of aesthetic knowledge and technique. View our pricing chart for the cost of your local San Francisco Bay Area breast implant surgery and other related treatments, lifts and rejuvenation procedures. Dr. Usha Rajagopal is a televised pioneer in the plastic surgery world. Her award winning work on women and female rejuvenation in the San Francisco Bay Area sets her apart from the competition. Dr. Usha has utilized her unique, female perspective of cosmetic surgery to educate and empower her augmentation patients for over 20 years. Her eye for aesthetic quality is only matched by her crafter’s hand and dedication to patient care. Improving natural confidence and self-assurance through implant surgery is an earmark of her work. Dr. Usha believes in uncovering the innate beauty of the chest and body, never letting the tools of operation define her results or patient satisfaction. The decision to have plastic surgery is a personal one. All surgical procedures have a degree of risk. There are specific risks and potential complications to breast augmentation. It’s important to weigh the risks versus the benefits before committing to any type of surgery. These risks and complications should be clearly understood. You must sign consent forms before surgery that you fully acknowledge the risks associated with the procedure. Patient education is necessary for you to make an informed decision prior to your breast augmentation. Dr. Usha will provide supplementary information about these risks, including answers to your questions, at any time. It’s important to minimize the chances of bleeding or complications as your recover. It’s advised you wait approximately four weeks before regular exercise. After surgery, light walking can be beneficial to healing. Your body will be sore in the weeks following surgery, so work towards your regular level at a gradual, sensible pace. Most patients are able to return to work within the same week of surgery. This is dependent on the physical activity level of your job and your individual body’s healing. Those who work from home or at a desk can return to work as soon as they feel capable of it. There is no committed long term appointment schedule for patients after surgery. Dr. Usha would like you to visit her a week after surgery to see that you are recovering properly and there are no complications. After that, patients may visit the office for “check-in” appointments which can be every few weeks to few months. How often these visits occur depends on you. If there’s any reason for Dr. Usha to be concerned she will have you visit more frequently. Postoperative care is important to us. When you visit our office Dr. Usha and our staff ensures you’re comfortable and your questions are addressed before you leave. There is no objective best implant type or shape. Today the vast majority of women choose silicone implants over saline for the many advantages silicone affords. Silicone implants tend to feel more authentic and be more durable than saline. Saline implants are initially less expensive and use smaller incisions. Other than implant type, there is an ideal implant size and shape for your body. An implant that’s perfect for one woman can be completely different for the next. Sizing your implants correctly is what separates great plastic surgeon from the rest. There are physical, practical and monetary considerations with your implant choice. Dr. Usha strives to find implants that not only meet your aesthetic goals, but more importantly, fits your body. To gain a clearer perspective of which implants are right for you, it's recommended you visit our office for an evaluation. As with any surgery that involves cutting the skin, there will be scars which may be visible. There are three incision sites: the armpit, the areola and underneath the breast. Dr. Usha makes the incision whichever area makes sense for your lifestyle. Armpit scars may be visible with tank tops or sleeveless attire. Areola scars may be apparent when naked or while wearing certain types of revealing clothing. Under the breast scars are often faint and is only visible from underneath the breast or when it is lifted. There is no such thing as a scarless breast augmentation. How visible your scars will be is dependent on several factors, including your incision site, skin pigmentation, and your body’s healing. If you are concerned about the scar, consult with Dr. Usha. It’s her aim to minimize the appearance of the incision, the scars of which cannot be completely hidden after surgery. I would not recommend scar treatment until there is some healing in the scar. The earliest laser treatment, especially to reduce redness would be with the Vbeam laser, I would say approximately 3-4 weeks and then for actual scar treatments with silicone gel sheeting, would be approximately a month later. The days immediately following your surgery are the most difficult. Patients generally feel a tightness in their chest with minimal pain. You will experience swelling, soreness and mild discomfort in your chest. This can be alleviated with medication and self care. Dr. Usha will prescribe medication for you just in case over-the-counter remedies aren’t strong enough. You may have to adjust the way you sleep to alleviate discomfort and keep the implant in position. You will be asked to sleep on your back for a few weeks. Pillows behind the shoulders will address some of the pressure you may feel. Like with most surgical recoveries, you are an active part of your own recovery process. Dr. Usha will provide postoperative care instructions on cleanliness and self maintenance. We recommend a sports bra/compression garment and gauze be worn for about six weeks after surgery. Your incision sites will need to be kept dry and clean to prevent infection. You will need to limit physical activity, other than light walking, for the first three or four days after surgery. After the first week or so you can gradually and carefully increase your activity level. You will be unable to lift heavy objects for the first three or four weeks as you recover. During your recovery you may dress in attire that compliments your new form, as long as incisions are covered. Your incision sites should be kept away from direct sunlight for a few months to prevent hyperpigmentation. Dr. Usha will be with you throughout this process. At any time you can schedule an appointment to see the doctor about your healing. It’s a commonly held myth that breast implants need to be replaced every ten years. However, the reality is that this is not likely a one-time-only procedure. At some point, one or two revision surgeries should be kept as a possibility down the line. Implants are capable of leakage and rupture and may need to be replaced. Over time implants may also malposition themselves within the breast pocket, requiring surgical realignment. Yes, breast implants do come with warranties. These warranties typically cover implant breakage or leakage and for offer replacements for implants within a certain period of time. There is often additional compensation offered to cover part of the cost of surgery as well. The warranties vary between the manufacturer and the type or model of implant purchased. The most current information about the implants and their warranties can be found on the manufacturer's websites. At the San Francisco Plastic Surgery and Laser Center we use high-quality implants by Ideal Implant, Natrelle, and Sientra. There is no definite period of time a given implant will last. A common misconception is that breast implants need to be adjusted or replaced every few years. This can lead to concerns about long-term costs and surgeries. On average, the majority of implants last 10-20 years without complications. Recent FDA reports indicate that one in six women will have their implants repaired or replaced within ten years of the original surgery. There are no guarantees of how long your particular implant will last. However, there are warranties available for implants that can cover some of the costs of surgery, replacements, or repairs. How natural will my breasts look after surgery? The outcome of your breast augmentation will depend on several factors, which include the skill of your doctor, the size and shape of the implants used, and your body type. If you are very slender the implant may be partially visible given its positioning inside the chest. Smaller implants fitted in thicker breast tissue looks more natural. Choosing a dramatic, multiple cup size increase may yield less natural looking results. If your implants are sized properly for your body they will appear more authentic to your form-- this is where your doctor’s skill in tissue and breast measurement is crucial. Choose a doctor that can determine the proper size and shaped implants for your body. An experienced doctor with a natural aesthetic eye can give you realistic expectations about your outcome: before surgery takes place. The risks of selecting the wrong doctor include ill-advised procedures and the “fake” look many women dread with augmentation surgery. For further information on Dr. Usha’s natural looking results see our Breast Augmentation procedure page or visit our office for a walk-through consultation. “I had a breast lift-and augmentation over 5 years ago after my first child and it was the best decision I have made ( other than having kids- of course). They still look and feel fabulous. “I immediatelty loved her! She is so sweet and warm and really makes you feel comfortable. I told her I wanted to be the exact same size as my sister and be around a full C or small D cup. She told me I would have to go with slightly bigger implants cause I was starting out with smaller brests than her, so to be the same size, I would to get 425cc. I was very nervous thinking that was a lot of cc’s, but I felt I could trust her to give me what I wanted.